I’m living a solo life now that’s why I’m here, I don’t have a husband anymore nor are my children around because the 2 of them are adults now. 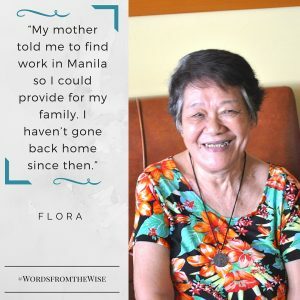 My mother told me to find work in Manila so I could provide for my family. So then I started to work as a housekeeper for years and I haven’t gone back home since then. Back in the day, I used to sell balut and many others in a sari-sari store before near here in San Juan. I have four grandchildren in Cavite, but they don’t know I’m here, although my eldest daughter visits me. My daughter used to work as a housekeeper while her husband didn’t have any work. They have 3 children but my daughter is the one working to keep their family alive. Since I didn’t have a family anymore, I use to live with my friend for 2 months. But my friend told me to just stay here with the sisters since it’s actually pretty nice here. I’m happy here now because the sisters are taking care of us. And I like watching the movies of Nora Aunor and Nida Blanca during our free time! But I also like to clean. I can clean the whole corridor, I can still do it since I’m pretty strong.